Recently I found something that might allow UofM to host auctions. My hope was that collectors would like it because there aren’t any fees – aside from PayPal, but I can’t currently help you there sellers. And based on the responses to the current poll question, it looks like there would be decent interest. I have currently set-up a test auction, which can be seen at the bottom of the feature bar on the right side of the page. The low placement is only temporary. If it were a live auction it would be at the top of the page to increase visibility. Since it’s an ugly test I thought I’d hide it. I’d love for a few people to try and bid. YOU WILL NOT BE CHARGED ANYTHING. I think that’s the best way to test out any bugs. Once the auctions have been given a fair test I’ll set-up a fairly simple auction – maybe a Dark Blue #153. That will be the live test. If the feeling is that UofM Auctions are a true benefit to the community and it will be used, then I may purchase some more features for the auctions. Or maybe after a few small auctions enough money will have been raised to simply purchase the upgrades. I’m not naïve enough to believe this can replace eBay. 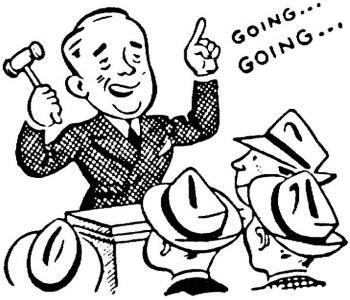 There will always be auctions that are better derved being listed on eBay. 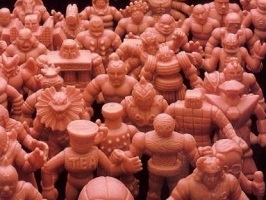 However, there are probably a fair amount of auctions that are best targeted at M.U.S.C.L.E. collectors exclusivly – especially if fees can be avoided. The other nice thing, I think, is that there will be better transparency. There should be a bunch of different ways to do it too. I think more collectors will be willing to try and win auctions if they feel that the bids are not secretly being manipulated. Again, it won’t be perfect – but I think it will, at least, be better than eBay. And please post any feedback about the UofM Auctions feature in the comments section below. That way it’s all in one place and it may help others with questions or concerns. And no, I don’t make any money off of it – unless I’m the one selling something. However, there may be a way to help offset the costs of the website through an eBay partnership. Basically another box would be added to the feature bar on the right side of the page. And clicks on those links could equal money. I’ll probably test this feature out very soon too. I currently have very low expectations for it. If I feel that it doesn’t add any real content value, then it will just go away. However, if it can be configured into something useful then it will stay. Thank you allfor you patience as these features are tested. Hoepfully the will be positive contribution to the M.U.S.C.L.E. community and this website. This entry was posted on Wednesday, January 19th, 2011 and is filed under UofM News. You can follow any responses to this entry through RSS 2.0. You can skip to the end and leave a response. Pinging is currently not allowed. I think this is a great idea but I do have some minor concerns. Can ANYONE bid and sell if they provide a real/fake username and email? Also, is there a planned feedback system to try and keep people honest? I guess my main concern is that I can see this as a good way to avoid ebay fees but what about buyer protection? I’m not sure if the money you’d save on fees would be worth avoiding ebay altogether. I think you guys forget a lot of times that there are collectors and impulse buyers who don’t know or don’t care about forums. ebay gets your items in front of a large audience of people. I think this is a good idea and will definitely buy things here but I don’t think sellers would get enough bids to justify the money they’d save on auction fees. maybe try a test that you can benchmark easily, like a SX. Something we know would go for about…. (how much) on ebay. As I hopefully said clearly in my post, this is a trial. If it is an added value to the community, then it will go forward. If not, then it just goes away. @jphat – Again, as I said, I don’t see this replacing eBay. Many auctions ARE better served on eBay. However, there may be some situations that M.U.S.C.L.E. collectors could benefit or prefer to use this system. I also agreed that something should be tested out for real, which is why I plan on having a Dark Blue #153 auction. It would be a low risk but high interest reality check for the auctions. Downside #1 logged. Only the last bid can be cancelled. That means the sign-up process will have to be tougher. I can see this is a good place to buy and sell MUSCLE related items and avoid ridiculous ebay fees that chips away your final sales. I also see that its not much diffent than inside forum auctions. Either way, It beats out ebay fees altogether. I think this would be a great way to sell. I’ll agree and disagree with Jphat79. Yes, Ebay does bring in more eyes on product; however, a SR wouldn’t be a good example. The news of UOM auctioning off a SR would spread like crazy. I do think a SR would fit better here because the news will spread and avoid Ebay’s fee. I would think vetting bidders would be the biggest problem. Feedback could be an issue as well, depending on what info you get from bidders and sellers. A smaller audience vs eBay/craigslist is obvious, but for me the relief of not dealing with the hassle of e/C is worth it. Same as an LRG auction or listing something in the “got toys” section. I don’t currently have it, but could people also use Google Checkout or is this feature PayPal only?